The FS-215 and FS-315 Shop Impulse Sealers from Fuji Impulse are impulse-sealing units sized and priced right for the small retailer. This remarkable food sealer machine allows even small shops to re-bag bulk commodities into virtually any sized package desired. 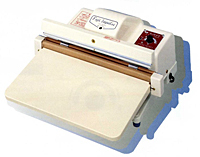 Easily operated and maintained, the FS-215 and FS-315 Shop Sealers handle a wide range of commercial films. Impulse heating across a special plate allows for a faster heat seal process. Ideal for sealing bags up to 200mm wide (the FS-215) and 300mm wide (the FS-315), a Shop Sealer will prove to be the perfect investment for your packaging needs! Package films can be sealed easily and quickly without any special skills. Only a slight pressure is needed for a strong sealing. A new mechanism provides more uniform sealing. Sealing pressure can be adjusted for opti mum sealing. Compact, light and portable. Electronic timer controls sealing tempera ture.